After the state went after distilleries for serving cocktails in their tasting rooms, distilleries responded with calls to update the law. The third week of the Alaska legislative session is now in the bag. The House was back up to 40 members for a few days, but is back down to 39 with the Friday resignation of Rep. Zach Fansler. In committees, legislators are continuing to churn through budget work and mull a handful of non-budget issues like distilleries and smoke-free workplaces. Just 70 days to go. After cancelling its meetings during the week, the House Community and Regional Affairs Committee held a Saturday public testimony session on House Bill 269, which would clarify that distilleries are, in fact. allowed to serve cocktails. The testimony was heavily in favor of the bill, 7-to-1 according to the Juneau Empire. The only opposition was fielded by CHARR and it allies that argue distilleries being able to serve a maximum of two drinks before 8 p.m. is really undercutting the bar business. Supporters of the legislation, including distilleries and their fans, are essentially asking for a common-sense implementation of the 2014 law that originally allowed distilleries to open their own tasting rooms akin to breweries. The distilleries have been serving cocktails without apparent problem for years, until the Alaska Alcohol and Marijuana Control Office was asked to crack down on the distilleries by bars. Geldhof is unwavering, let the record show weve heard the term goofball 7 times in 4minutes. Juneau lawyer Joe Geldhof, who formerly worked for the Alaska Attorney General’s Office, told state lawmakers that the ABC board’s tasting room regulation was based on a “goofball” legal opinion. Rep. Paul Seaton’s proposal to early fund K-12 schools with a draw from the constitutional budget reserve is headed to the House floor already. The bill has received rave reviews from school districts and municipalities that have been dealing with years of headaches caused by the Legislature’s predilection for passing budgets so late. The bill covers just this year, while a bill in the Senate Finance Committee by Sen. Gary Stevens, R-Kodiak, would institute an early school budgeting process starting next year. The bill is likely to face push back from minority Republicans, who’ve said the bill complicates the budget process by taking a big chunk of it off the table and admits defeat on the 90-day session. The State of the Judiciary is scheduled for 11 a.m. Wednesday. The annual address by Chief Justice Craig Stowers typically doesn’t get much headlines, but it’s always a worthwhile watch because it provides a window into a branch of government that seems to mostly have its act together. The court system has been dealing with all the problems that the Legislature and governor’s office have been grappling with–budget cuts, crime and drug abuse–but has been quietly making practical policy choices like cutting back on Friday hours and opening new court practices to handle drug abuse. In a change of pace from beating up on the governor’s supplemental budget, the Senate Finance Committee held a short hearing on Sen. Peter Micciche’s Senate Bill 4, which would set up an easier licensing path for barbers and hair braiders not interested in chemical procedures like dye jobs and chemical straightening. Currently, both groups have to go through the additional training that the state requires for hairdressers, which Micciche and backers of the bill say is a huge burden and barrier to entry. The legislation doesn’t seem particularly controversial and it would have likely moved from committee on Friday, but the committee held onto it to consider an amendment that would allow the state to charge a licensing fee for the new licenses. The House Rules Committee meeting on the smoke-free workplaces bill, Senate Bill 63, that was originally scheduled for last Monday before being cancelled and rescheduled to Thursday before being cancelled and rescheduled for tonight has been–you guessed it–cancelled. After it was revealed the state was not doing its job in reporting it wiretaps, the Department of Law has revealed three wiretaps conducted in 2015. Read: Delayed report reveals three state wiretaps in 2015 via the Juneau Empire. It’s been more than a year since the last episode of the Hello Alaska podcast, but those guys (including me) are back with a reboot. Listen on your favorite podcast app and hit me up if it’s not there so we can submit the feed, or Read: Episode 16 – Reboot via Hello Alaska! The 1,000-mile Yukon Quest is underway after a chilly start in downtown Fairbanks on Saturday. Read: There they go: Mushers begin 1,000 mile Yukon Quest via Fairbanks Daily News-Miner. 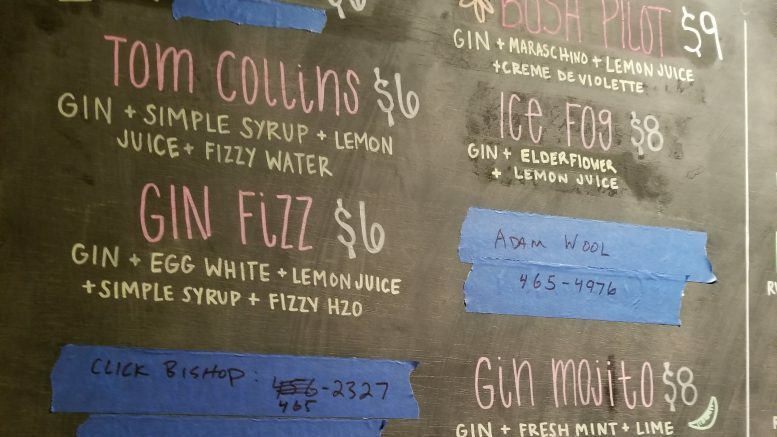 1 Comment on "AKLEG Recap, Week 3: Distillery cocktail bill draws three hours of testimony, including ‘goofball’ comment"